A long time ago I was a tofu eating vegetarian. True story. I drank almond milk. I never used cream for anything. I “buttered” my store bought bread with margarine. I ate ramen noodles. I downed bags of potato chips in one sitting (well ok I can still do that), I drank pop (what us Canadians call soda), I ate a candy bar for lunch everyday, and if I did drink water it was flavoured water (and not the naturally flavoured water either). I know. My food sins are pretty bad. I wanted to eat well. I wanted all the healthy foods. But as a young couple with no money (and no real knowledge of even proper nutrition), I fell into the processed food trap. It said “all natural” on the box. It has to be healthy…right? I hear this statement often: “I would love to do what you do, but I wouldn’t even know where to start”. I never know how to respond to that. It’s not like someone drew a road map out for me either. I had to figure it out as I went, all the while with one main goal in mind: eat the best food that we can from the closest in our area and at the lowest cost. That has led us to producing most of our own food ourselves, and it has been a lot of learning along the way. 1. Learn About Your Food. When we first started out this journey we ate a lot of soy products, and strayed away from most animals fats using vegetable based oils instead. Now we’ve done a complete switch and use animal fats and limit vegetable based oils to avocado oil, coconut oil, olive oil, sunflower oil and peanut oil. No shortening, no margarine no canola oil. The animal fat vs vegetable oil debates are pretty intense, and I’m not about to write an entire post on it today. I’ve chosen to eat this way mainly because even with the almost extinction of animal fats from our kitchens heart disease rates are still rising. There is clearly more going wrong with our health and food then just fats. (For an interesting read on how vegetable oils became a household staple check out this article). We also don’t eat soy, or at least eat as little of it as possible because of the health concerns with it and the rising amount of GMO soy products. So do your own research, and really look into what sort of food choices you want to continue making. 2. Make What You Can Yourself. The first product I started making was bread. 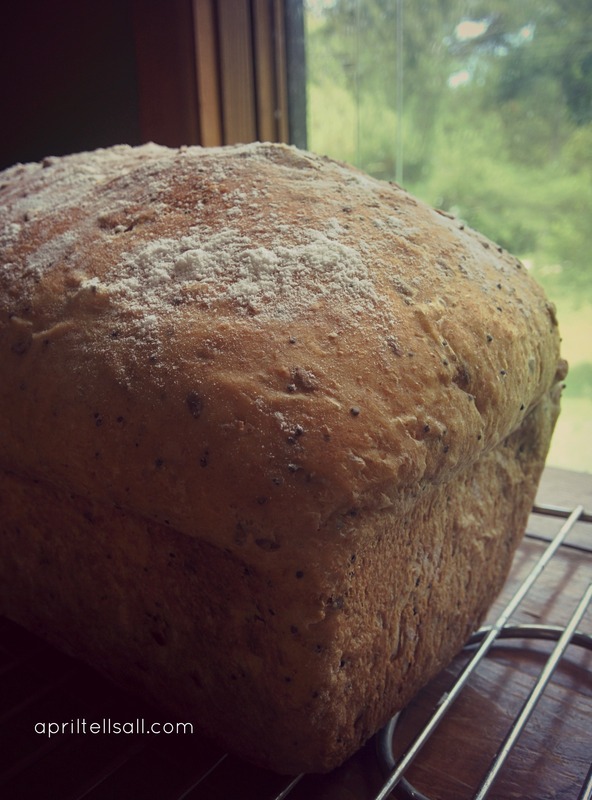 The smell, the taste, and the texture is so much better than store bought bread. Plus the freedom I felt when I was able to walk by the bread section and not buy any was awesome. I wanted more of that freedom and pushed on trying and learning new recipes for more and more of what I would normally buy. And let’s be real – store bought bread has no flavour. Why wouldn’t you make your own? 3. Make Your Own Cleaners. Household cleaners was the next thing I stopped buying. Vinegar, baking soda, castile soap, and a few essential oils are a whole lot cheaper, and don’t bring dangerous chemicals into your home. Homemade laundry soap and vinegar for fabric softener are just as effective and cost pennies a load. You would be amazed at what you can make yourself. 4. Garden. My first garden was a disaster and I got nothing from it. Not one. single. thing. So the next year I started small – and had enough zucchini to feed half the town. I sliced it and froze it and we had zucchini all winter long. The next year I tried a bit more: peas, spinach, beans, zucchini, and tomatoes, and we ate well that year. If you can’t garden due to lack of space try growing what you can in containers. You don’t have to spend tons on planters, if you don’t mind the look of them, buckets from bakeries, coffee shops, and hardware stores are cheap (or free), and work great. 5. Get Chickens. Chickens are becoming quite the backyard rage as more and more people are looking for alternatives to factory food. You can have them in the city if your neighbours don’t mind, just don’t get a rooster. Hens do sing an “egg song” but generally are pretty quiet. 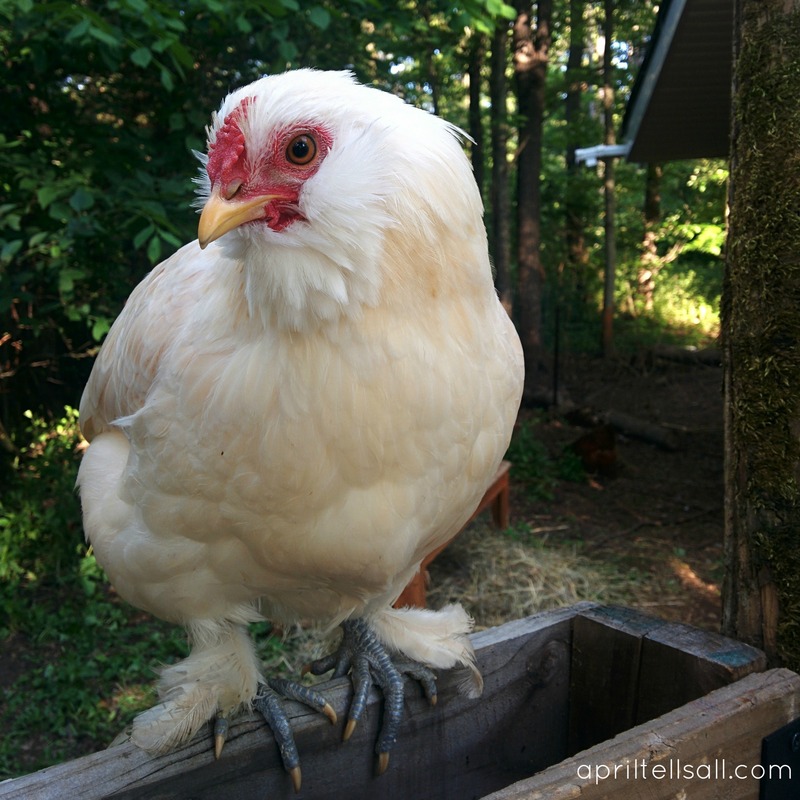 Keeping a clean coop will keep the smell down. Our girls hardly have a smell at all because I clean out the coop regularly. Be sure each hen has the recommended amount of space and you’re all set. 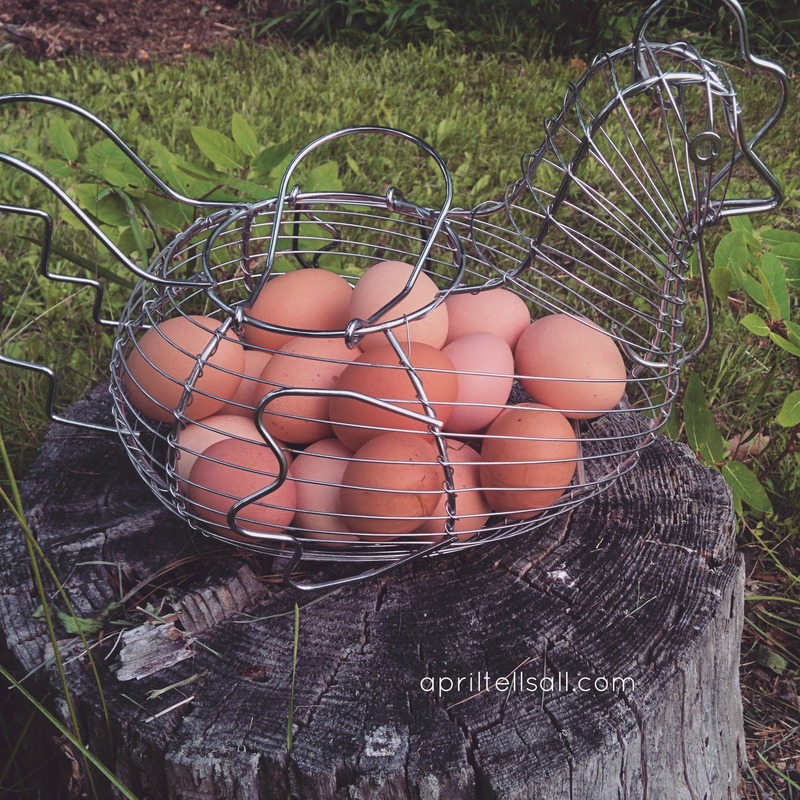 In return chickens will give you fertilizer for your garden, eat all your kitchen scraps and turn it into eggs, mow your grass for you, and eat pesky bugs (my girls love it when I find juicy grubs in the garden for them. They’ll also sit on my lap and eat all the mosquitoes buzzing around in the evening). Fair warning: they will mow down all your little seedlings and steal the strawberries off your plants before you get there so keeping them away from your garden is probably best 🙂 (this is why our chickens are not fully free range). With a predator proof coop and run, chickens are very easy keepers and they give back huge returns. 6. Buy local. If nothing else support those in your community who grow food. By shopping at just another big name grocery store you are sending your dollars to those huge corporations that don’t provide anything back to your community, and quite frankly don’t need your money. Supporting those in your community means you get fresher food, support the economy in your community, and help a struggling farmer pay their bills. So don’t know where to start? 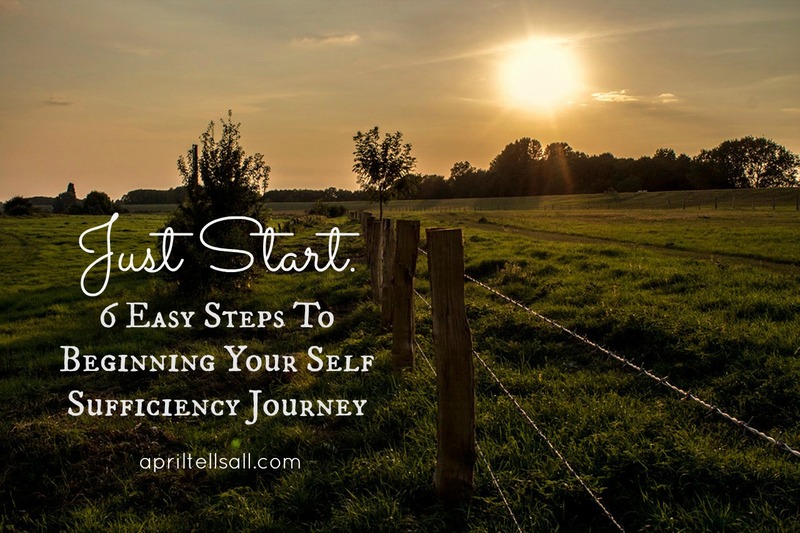 Start where you are and just keep learning. The rest of it will come together in time and before you know it you’ll be out butchering your first rooster (who was delicious by the way), milking your goat, and waiting somewhat patiently for your tomatoes.